Is there a "Don't Ask, Don't Tell" policy on US Predator strikes inside Pakistan? Has Pakistan assured United States that any Pakistani protests against US drone attacks are meant for public consumption inside Pakistan? Are the reports of mistrust between US and Pakistani military a figment of of the US media imagination to defame Pakistani military? Has the policy of secrecy recently been violated by Dianne Feinstein when she revealed that the Predator drones attacking in FATA are flown from a Pakistani airfield? Do Pakistanis believe the farce of Pakistani government's public statements of protest, anger and dismay at the US policy? Are there any lines agreed between US and Pakistan differentiating direct ground incursion by US special forces and Predator attacks from the sky? Let's try and answer the above questions by examining the events on the ground. In September, 2008, a team of US Navy Seals was dropped by helicopter in the area of Angoor Adda in South Waziristan. There was a reported firefight between the US commandos and Pakistani soldiers on the ground. It was followed by an air strike which killed several Pakistani soldiers and civilians that the US said were militants. The Angoor Adda raid by the US Navy Seals brought a stern warning to the US from Pakistani military. "The sovereignty and territorial integrity of the country will be defended at all cost and no external force is allowed to conduct operations inside Pakistan," said Pakistan's Army Chief General Ashfaq Pervez Kayani in a strong statement after the incident. The US commando raid was a surprise to Pakistanis and Kayani's warning was genuine. It was conveyed to the United States by Pakistan loudly and clearly in both public and private. As expected, it was heeded by the Americans. Since the September 2008 incursion by the US Navy Seals, there have not been any more reported ground attacks in FATA by American commandos. However, the Predator strikes inside FATA and Pakistan's public protests present a different story. The frequency of Predator air-strikes on suspected Taliban and Al-Qaida targets has dramatically increased recently. Hardly a day goes by without reports of such strikes by US drones operated by the CIA. 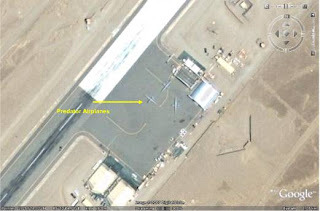 And Pakistani government led by Zardari routinely protests strikes by US armed drones that reportedly take off from Shamsi airfield near Jacobabad in Pakistan, as visible on Google Earth until very recently. Anyone with a rudimentary knowledge of the American drones knows that these machines fly low and slow making them easy targets for any military with a minimally sophisticated air defense system. Even if one disregards the Feinstein revelation and assumes that such contraptions fly out of Afghanistan, Pakistani military is clearly conveying the message that such drone strikes are deliberately tolerated by choosing not to shoot them down. In fact, it is easy to conclude that Pakistani military not only knows but approves Predator missions in FATA. And people who suggest that CIA does not trust Pakistani military and does not share information about drone flights and strikes are either being deliberately disingenuous or just smoking Afghan poppy. Why is this game of Charades being played by US and Pakistan? Who are they fooling? Measured by the flagging support for war on terror, they are certainly not fooling the people of Pakistan. And the situation next door is not any better. Rising casualties of Afghan civilians are turning the Afghan people against the US military and the Karzai government and strengthening support for the Taliban. After seven years of US presence, many Afghans now believe that the Taliban offered them a much better sense of security and law and order when they ruled the nation until 2001. Last October, Christian Science Monitor reported on how the Taliban handled complaints from villagers near Kabul about a gang of thieves. The Taliban's parallel government in Logar Province – less than 40 miles from Kabul, the capital – tried and convicted the men, tarred their faces, paraded them around, and threatened to chop off their hands if they were caught stealing in the future. The thieves never bothered the locals again. A serious but unintended and extremely dangerous consequence of the US air strikes in FATA is that the militants are moving further inland from FATA in to Pakistan's settled area such as Swat and threatening to destabilize the entire country. A destabilized, nuclear-armed Pakistan will be far more dangerous to the US, the region and the world than anything we have seen in Afghanistan or Iraq. The Obama response to the deteriorating situation in Afghanistan is to order more Predator strikes and thousands of more US troops. This assumes that the problems are mainly the lack of firepower and of troop strength. But it's likely to have the opposite effect. More Predator strikes and more troops mean more fighting which will lead to more American and Afghan civilian casualties. And it will only increase the public opposition to the US presence there, and make the entire region a much more powerful magnet to draw more global Jihadists from around the world. These "holy warriors" love nothing better than to kill the American soldiers and achieve "martyrdom" for themselves. "A destabilized, nuclear-armed Pakistan will be far more dangerous to the US, the region and the world than anything we have seen in Afghanistan or Iraq." It is a very popular belief among all strata in Pakistan that when Pakistan goes down (if at all it goes down), it will do so with a big nuclear bang...Pakistani establishment uses it as a blackmailing tactics for pretty much anything. That's how they manage to get all their money, IMF loans, military aids. It remains to be seen till when the world heeds to this. I think you got incidents mixed up which happened in different time frame. There was no fight with Pak's "official" army or paramilitary in September 2008 ground assault special operation by the elite US Seal Team Six commandos. ground operations (in September ) to kill Jalaludin Haqqani & family. "Following Bush's decision, US navy Seals commandos, backed by attack helicopters, launched a ground raid into Pakistan last week which the US claimed killed about two dozen insurgents. Pakistani officials condemned the raid as illegal and said most of the dead were civilians. US and Nato commanders are anxious to halt infiltration across the Afghanistan-Pakistan border of insurgents and weapons blamed for casualties among coalition troops. The killing of a US soldier in eastern Afghanistan yesterday brought American losses in 2008 to 112, the deadliest year since the 2001 intervention. The move is regarded as unprecedented in terms of sending troops into a friendly, allied country." Incident 2: US air strike on Pak's paramilitary forces (Frontier Corps) checkpost in Mohmmand agency. The US military confirmed that it had used artillery and air-strikes in self-defence after its forces had come under fire from the Taleban. “Shortly after the attack began, coalition forces informed the Pakistan Army that they were being engaged by anti-Afghan forces in a wooded area near the Gora Pai checkpoint,"the Pentagon said in a statement. "Washington sent Special Forces into Pakistan last summer after intercepting a call by the Pakistani army chief referring to a notorious Taleban leader as a “strategic asset,” a new book has claimed. The intercept was ordered to confirm suspicions that the Pakistani military were still actively supporting the Taleban whilst taking millions of dollars in US military aid to fight them, according to the “The Inheritance,” by the New York Times correspondent David Sanger. In a transcript passed to Mike McConnell, the Director of National Intelligence in May 2008, General Ashfaq Kayani, the military chief who replaced Pervez Musharraf, was overheard referring to Maulavi Jalaluddin Haqqani as “a strategic asset”. The remark was the first real evidence of the double game that Washington had long suspected President Musharraf was playing as he continued receiving US military aid while aiding the Taleban. Mr Haqqani, a veteran of the anti-Soviet mujahidin wars of the nineties, commands a hardline Taleban group based in Waziristan and is credited with introducing suicide bombing into themilitants’ arsenal. " WASHINGTON — With two missile strikes over the past week, the Obama administration has expanded the covert war run by the Central Intelligence Agency inside Pakistan, attacking a militant network seeking to topple the Pakistani government. Members of Pakistani tribes offered funeral prayers on Feb. 15 for victims of an American missile attack in the North Waziristan region, near the Afghan border. The strikes are another sign that President Obama is continuing, and in some cases extending, Bush administration policy in using American spy agencies against terrorism suspects in Pakistan, as he had promised to do during his presidential campaign. Just Pakistan, not the world. Flying predators out of Pakistan make sense as it does not breach air defenses and allow operational control. As Kissinger once said it is more dangerous to be u.s. friend than enemy. Pakistan has learned its lessons in 65, 71, 90 and need to keep its options open especially since many in American political elites do not like Pakistan because of middle east politics. Obama is strategically better for Pakistan as Obama administration have discarded India as primary partner in Asia(along with Japan).Now coz of economic crisis, China is the new friend and partner.Now Israel and India is out in the cold. Hillary Clinton also cancelled a visit to India for refusing to get into Pak-Iran-Afghan "regional" co-operation.America hold the notion rightly or (very) wrongly that if India "sells out" on Kashmir and get out of Afghanistan, Pak will break all ties with Taliban.Swat deal is warning shot from Pak Army to US.Faizullah is being cultivated by Pak Army and its complicity in allowing his FM transmissions clearly point towards it.Even a country like Cuba, which lives off on dollars from tourism has(and uses) high-powered transmitters to jam "US pro-democracy news and music". Its implausible argument that Pak don't have any! India is worried about the territorial integrity of Pakistan on the views of SHAUN GREGORY who is a professor at the Pakistan Security Research Unit, University of Bradford. Losing integrity: Is Pakistan dividing again? There is a school of thought which has long argued that the creation of Pakistan in 1947 was a geographical, ethnic, cultural, economic, and political artifice, sewn and held together only by the weak thread of a questionable religious homogeneity, and that consequently the project of Pakistan would eventually be torn apart by its own contradictions. The break up of East and West Pakistan in 1971, the failure of successive leaders in Islamabad to build a nation through a just federal dispensation, and the unwillingness to settle the contours of its borders with its neighbours, has meant that the continuation of Pakistan has remained an open question. On the face of it, the success of the murderous Mullah Fazlullah and his militant army of 3,000 men in taking control of Swat and Malakand areas of Pakistan’s North West Frontier Province (NWFP), would not appear to be of great significance in the unfolding of the destiny of Pakistan. However, history may well record that the abject surrender of Swat in a phoney ‘peace deal’ marked an important stepping stone on the path to Pakistan’s destruction. While the weak and hapless Zardari/Gilani government continues to waste precious political capital on PPP infighting and avoidable confrontation with Nawaz Sharif, to the west of the Indus river dynamics are unfolding which have placed Pakistan’s integrity once more in question. Since 2001, the Pakistan Army and ISI have been playing a dangerous game in providing sanctuary to the Afghan Taliban in the Pashtun areas of Northern Balochistan and in the FATA, in the expectation that Mullah Omar would orchestrate a comeback in Afghanistan, displace the Karzai regime or any of its western-backed successors, force NATO from the region, and reverse India’s growing influence in Afghanistan. In early 2009, this strategy appears to be working. The Afghan Taliban are influential across all but the most northerly areas of Afghanistan and a peace deal of some sort with Mullah Omar is predicted this year or next. Pakistan has, however, entered a Faustian pact with Mullah Omar and the Quetta Shura, and the darker implications of that bargain have only now begun to dawn on Pakistan’s ruling elite. As the Afghan Taliban have regained power and momentum from sanctuaries in Pakistan, they have also created and driven the context for the emergence and evolution of virulent forms of Pakistani militancy and terrorism, both in Pakistan’s Pashtun areas and across Pakistan. These dynamics have been reinforced by the Pakistan army/ISI’s continued embrace of Punjabi terrorists, and by the military focus of the US-led war on terror which has fuelled radicalisation on both sides of the Durand Line. In this context tribal armies in the FATA have mutated into new forms of radical extremist groups such as Baitullah Mehsud’s TTP and Fazlullah’s TNSM. Al-Qaida has re-emerged and re-established something of its global reach, foreign fighters from as far as Algeria, European diasporas, western China and the Philippines have once again poured into the region, and the huge expansion of largely Saudi and locally-funded madrassas has ensured a continual supply of young Afghans and Pakistanis ready to die for the militant cause. The Pakistan army and ISI have presided over this rising tide of terrorism and religious extremism in the expectation that they could achieve their aims in Afghanistan through the Afghan Taliban while keeping control of Pakistani militancy and terrorism on their own side of the border. In the wake of the bombing of the Marriott hotel in Islamabad in September 2008, and of the escalation of terrorist violence in Pakistan’s cities which preceded it, that calculation has proven disastrously wrong. Given the perilous situation in which the Pakistani state now finds itself, the question of why the Pakistan army/ISI has still not thrown its lot in with the US and NATO and unleashed the full force of the Army and the ISI against the Afghan Taliban, the tribal militants, and al-Qaida, requires an answer. Only two arguments make any sense: either the Pakistan Army-ISI is unwilling to do so or it is unable to do so. If the former, then that can only be because the Army-ISI still believes it can contain the militancy and terrorism within Pakistan. If this is the case, then one wonders why the Army-ISI continues to think that and how many more Marriotts on the push side, and what western incentives on the pull side will it take before the Army and ISI make a decisive break with past policy? More gravely for Pakistan, for its neighbours, and for the West, the other possibility is that the Pakistan Army and ISI may genuinely have reached the practical limits of their ability to control militancy and terrorism. Pakistan has committed up to 120,000 troops to the FATA region and since September 2008 has not been able to make a substantive impact in Bajaur and Mohmand Agencies. Perhaps the real key to understanding the situation lies in a synthesis of both arguments. Mullah Omar and the Quetta Shura is understood, through a decentralised command structure and with the support of al-Qaida, to broadly control the tribal militants in Pakistan, such as the TTP and TNSM, which pose the most direct threat to the state of Pakistan. Mullah Omar and the Pakistan Army-ISI are, thus, locked in a fearful stalemate: Mullah Omar checks the power of Pakistan’s militants and holds them back from escalating violence against the Pakistani state, and in return the Pakistan Army-ISI continues the support and protection of Mullah Omar and the Quetta Shura and pays lip-service to western demands for tough action against the Afghan Taliban. Either way, the Pashtun areas of Pakistan are beyond the reach of the Pakistani state and it is difficult to see that they can be recovered. The situation in Swat, thus, stands as an expression of a larger crisis of state legitimacy which for all practical purposes will likely see another piece of Pakistan break away. The writer is a professor at the Pakistan Security Research Unit, University of Bradford. The CIA still won't publicly acknowledge that its using a fleet of killer drones to take out targets in Pakistan. But yesterday, new Director of Central Intelligence Leon Panetta told reporters that the Agency is going to keep doing... well, whatever it is they do Pakistan. Check out this interchange. That question, of course, is raised by the fact that the U.S. has spent many years now doing exactly this: employing various means — including but not limited to drones — to abduct and kill people in multiple countries whom it has unilaterally decided (with no legal process) are “terrorists” or who otherwise are alleged to pose a threat to its national security. Since it cannot possibly be the case that the U.S. possesses legal rights that no other country can claim — right? — the question naturally arises whether Turkey would be entitled to abduct or kill someone it regards as a terrorist when the U.S. is harboring him and refuses to turn him over. Pakistan's cabinet has approved a plan to introduce widespread political and administrative reforms to its tribal areas on the border with Afghanistan, bringing landmark changes to an area that has long been a sanctuary for armed groups. The changes, which include the extension of fundamental constitutional rights to citizens, will see Pakistan's constitution and penal code extended to the seven semi-autonomous tribal "agencies" for the first time since the country gained independence from the British in 1947. "The time has now come for [the people of the tribal areas] to also be brought into the ambit of being Pakistani, to end the ongoing deprivation of their areas," said a statement issued by Prime Minister Nawaz Sharif's office on Thursday, following the cabinet meeting that approved the reforms. The laws will give citizens access to fundamental rights and the ability to vote for representatives in provincial and local council elections, among other benefits. Currently, the northwestern region is governed under the British-era Frontier Crimes Regulation (FCR), a draconian law dating back to colonial times which leaves citizens with no recourse to formal courts and open to collective punishment for the crimes of members of their tribes. The lack of formal law and writ of the state in the tribal areas made them a haven for armed groups, including the Tehreek-e-Taliban Pakistan and al-Qaeda, for decades. Pakistan's military regained control of North Waziristan - the last of the tribal areas still under Taliban control - after an offensive launched in mid-2014 that lasted until the end of 2016. Since then, violence has dropped across the country, but sporadic high-profile attacks, such as the bombing of a shrine last month that killed 88 people, remain common.